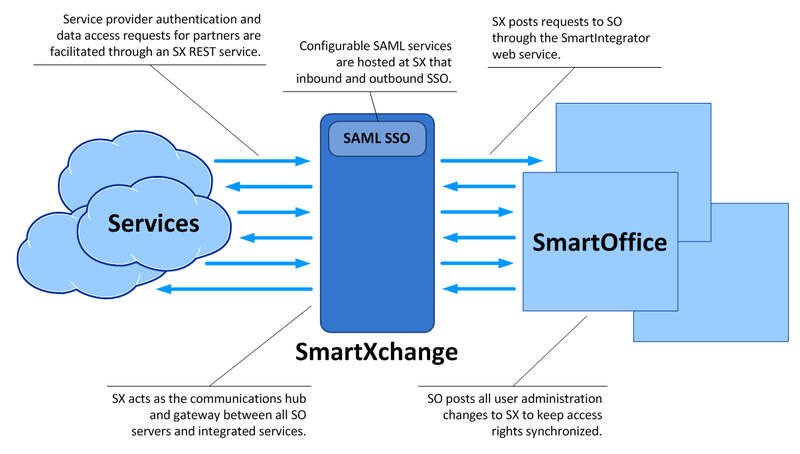 The SmartXchange Proxy is a service used the same way as the SmartIntegrator XmlEngine servlet, but is a single connection point able to reach multiple SmartOffice servers. SmartXchange also provides Ebix administrative control to provide partners with authenticated access to SmartOffice servers for their services. Requests are made through XML requests, and a response is returned. Depending on your decision to access SmartIntegrator directly or communicate through SmartXchange, the processing and formatting of your Requests will change slightly. The primary testing method for SmartXchange Proxy is the TestBed, which support both SmartIntegrator and SmartXchange. Note that your application must use Transport Layer Security (TLS) v1.1 or later to communicate with the SmartXchange proxy service. To send SmartXchange proxy requests, you must first understand how to send requests to the XmlEngine API. SmartXchange requests are essentially XmlEngine requests enclosed in special proxy tags. SmartXchange tags: The XmlEngine request is located within the siData tags. Request header information: In the XMLEngine request, the <header> element contains empty <office>, <user> and <password> elements. In SmartXchange requests, it is typical to leave these elements empty (the DXOUserName element passes information about the user instead). However, these elements are required. DXOUsername: The <DXOUserName> element is required. It passes the user information to the proxy server. There is a second "Adapter" web service running on SmartXchange used for administering services and user subscriptions running over the SmartXchange platform (Examples include https://dxo20qa.ez-data.com/dxoapp/adapter or https://dxo20.ezdata.com/dxoapp/adapter). All requests to this service need to have the Partner adpName, user, and password inputs passed in the header, just like a Proxy request. This action allows partners to retrieve the name of each service and find out which SmartOffice sites have their service enabled. To make this request, the partner credentials are the only input needed. This action allows partners to retrieve the DXOUserName value of every user that has subscribed to their service. This request can only be done for a single site and service per transaction. This action allows partners to retrieve the SmartOffice URL and XmlEngine URL for a particular SmartOffice site. This action allows partners to retrieve the UserID and UserName properties for a SmartOffice user account using the DXOUserName value. This action allows partners to determine whether a specific user has their license enabled.